For evolutionary biologists, the best experiments are those already going on in nature. The different conditions in which humans have lived for tens of thousands of years have made us adapt and change. Now a new study published in Science shows that such adaptation has led to genetic mutations in Greenlandic Inuits that help them counteract the bad effects of their high-fat diet, based heavily on fish and marine mammals. The study could help us understand how genetic diversity impacts health through diet and could eventually lead to personalised diets that are based on the genetic make-up of individuals. The strongest evidence that diet can influence natural selection can be seen in changes to the lactase gene, which helps us digest the lactose in milk. In many mammals and humans, this ability disappears after weaning in childhood, but can persist into adulthood in people who carry the selected genetic variant. In these individuals, the mutation provides a strong selective advantage as they get additional nutrition from dairy. More generally, people with genetic mutations that help them to efficiently digest the food available are more likely to survive and have healthy children, who will themselves inherit this capacity through their genes. Over time, these descendants become over-represented in the population. And it is these specific patterns of genetic diversity that scientists are able to pick up thanks to statistical approaches. The new study analysed genetic diversity in 191 people with indigenous Greenlandic Inuit ancestry. The authors then compared their genomes with those from 60 people from Europe and 44 from East Asia. The team specifically looked at genetic markers previously found to be associated with heart disease and metabolic disorders and identified a cluster of genes that had undergone a lot of changes in Greenlandic Inuits compared to the two other populations. These genes encode the enzymes FADS1, FADS2 and FADS3, which determine the levels of polyunsaturated fatty acids. These fatty acids are an important component of fat tissue, and the team discovered that Inuits have mutations that seem to help their bodies produce less fatty acids. Although polyunsaturated fatty acids are not the “bad” kind of fat, changing the production of one fatty acid through diet, for example, affects all fatty acids. The study authors speculated that the reduced amount of fatty acid in the Inuit population could compensate for a high dietary intake of omega-3, a type of polyunsaturated fatty acid, through fish and seafood. They estimate that selection began to act on these genes in the Inuit ancestors, who lived in or around Beringia about 20,000 years ago. Most genomic scans for natural selection provide only partial evidence that can be said to translate into true adaptive traits. This is because the molecular mechanisms underlying adaptation are generally unknown. So although scientists can see that a genetic change has taken place, they can’t say how it influences the human body. To gain further understanding of how the identified genes relate to the overall health of the Inuits, the researchers took advantage of Greenlandic cohorts with extensive clinical information collected as part of a general population health survey. They found that the mutations in the Inuit population were associated with lower “bad” cholesterol and insulin levels, which protects against cardiovascular disease and diabetes. The mutations also seem to have reduced their height by two centimetres, nearly an inch. This may be because fatty acid impacts the regulation of growth hormones. Interestingly, this is one of the strongest effects on height reported so far. The researchers found that the mutations that cause shorter height in the Inuits are also associated with shorter height in Europeans, but this was missed by a number of large-scale studies. This work shows, then, how the investigation of indigenous populations that have adapted to extreme environments are a good way to identify genetic factors that influence complex traits. Understanding exactly how the selected genetic variants modify levels of fatty acid would require additional experimental studies. Although the Science study pinpoints candidate mutations, the exact mechanism of action at play remains to be discovered. It could be possible that multiple mutations in the different fat metabolism genes identified by the researchers are at play, including mutations not identified in the present study. The low incidence of cardiovascular disease in Inuits has previously been linked to their high intake of fish oil and omega-3s. However, it may be that the genetic adaptation of the Inuits to their diet, rather than the diet itself, explains this protection. While researchers and health officials have long believed that fish oils protect against heart disease, the new study challenges this. 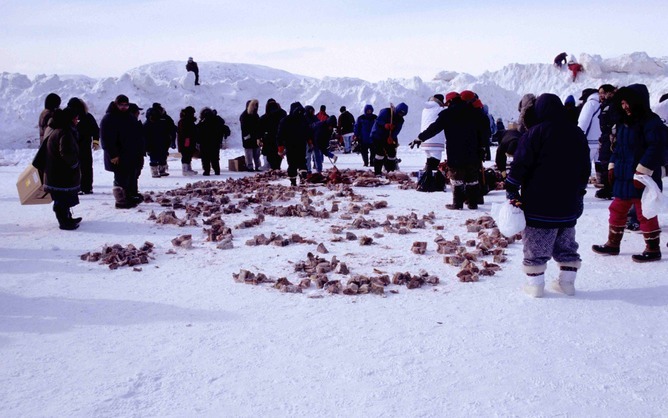 It may be good for the Inuits to eat a huge amount of omega-3 fatty acids, but not for all of us. Such gene-diet-disease interactions may become the future tools for personalised nutritional advice, and holds the promise of a leading role for the field of nutritional genomics in improving our health and preventing disease. Visit the Elsevier Store to access books on genomics, nutrition, nutrigenomics and much more! Below is a small selection of books that discuss these topics. Use discount code “STC215″ at checkout and save up to 30% on your very own copy! Nutrition and Genomics explore the ethics, law, regulatory analysis and communications aspects of nutritional genomics. The Mediterranean Diet provides a holistic view of the Mediterranean diet and nutrition as applied to disease prevention and health.